Some of us like it hot and spicy – food wise that is. In many cultures, spices bring the heat to a number of cuisines. If you already enjoy spicy foods, great, if not, you could be missing out on a great benefit. New research suggests adding spice to your food can contribute to a longer life. The latest findings were published in BMJ. Researchers examined the diets of 487,375 people between the ages of 39 and 79m who were all enrolled in the China Kadoorie Biobank. Participants with cancer, heart disease and stroke were excluded from the study. After a follow-up seven years later, 11,820 deaths were reported for men and 8,404 for women. A link was made between those who consumed spices and mortality. Furthermore, mortality was lower among those who ate spices and did not drink. Among the group, fresh and dried chili peppers were the most popular. Researchers do note that additional research needs to be conducted to solidify spices’ role. 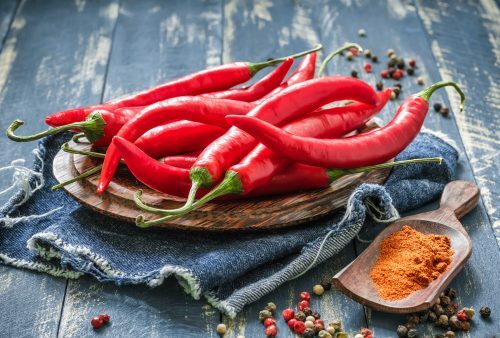 Although the new research suggests eating spicy foods could make you live longer, previous research has shown that spicy foods can benefit your health in other areas as well. Weight loss: Capsaicin, the active component that makes peppers spicy, has been shown to promote weight loss. Studies have shown that consuming spicy foods can speed up your metabolism by eight percent. Furthermore, a Canadian study revealed men who consumed hot sauce also consumed 200 fewer calories. Heart health: Capsaicin also works to promote heart health. Studies reveal capsaicin can improve cholesterol, which in turn leads to a healthier heart. A study from the American Chemical Society revealed capsaicin can help reduce the accumulation of cholesterol by speeding up its breakdown rate. Vitamins: Eating spicy chilies can contribute to overall healthy eating. Spicy peppers contain many essential vitamins and minerals, which are required by the body. Furthermore, these vitamins can work to boost our immune system warding off illness. If you don’t have a taste for spice, maybe start off with small amounts of peppers, or a more moderately-spice pepper. You wouldn’t want to miss out on all of these health benefits would you?